Brian Lavelle is a Scottish born sound artists and rich drone maker, he's been creating music for the last 15 years or so - with his most know series of pieces being the "Radios" series of ten albums he composed with Richard Youngs. 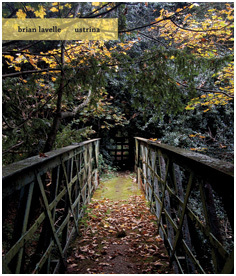 "Ustrina" is Lavelle first full length album on the always rewarding Italian based Afe label. The album is made up of one long piece of light descending to dark drone work entitled "Pyre Nullity", which lasts just shy of the 70 minute mark. The piece starts off fairly bright, clean and active in it's rich harmonic drone plates, which are surrounded by fairly rapid descending tones which at times give the feeling moving on quite fast or falling. This more glowing and sun warming feel goes on for the first twenty minutes or so then slowly but surely the piece turns slower, more dark and murky as Lavelle very gradually slows the piece pulse down and the light tones are replaced by more shadowy and expansive gloomy drones. As the track darkens slows and greys Lavelle introduces a slow juddering tone, haunting slow monition grim bell circles, traces of backward matter, ominous bird chirps which all give the track quite a creepy and disturbing feel. It all very much fits the wonderful cover photographs of autumn leaf covered landscapes; as it feels almost like your following the life of a dying leaf; first your on a tree in the warming lush sunlight, then you fall off the tree descending to the ground and then start to rot and decaying with other leafs. It certainly gets more organic, bleak and earthy as it goes on indicating the leaf's slow rot and breakdown. "Ustrina" is a very accomplished long form piece of shifting and descending drone work that's cleverly and dramatically layered with subtle field recording elements. With Lavelle creating a very rewarding descent from warming and active drone matter to darker and more sinister drone emissions.